My family has a sort of history with the chess tables in Washington Square Park—some few decades ago, a cousin was arrested there for a dark and heinous crime! This story was my first introduction to the world of chess in the park, and as you may imagine, it has sparked my interest and imagination. 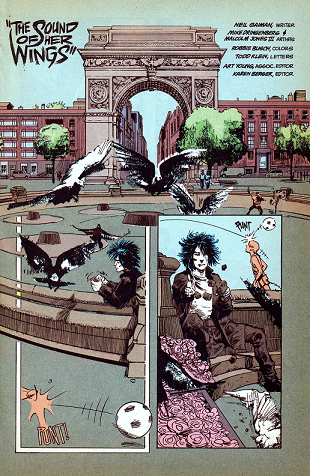 Now that I’m attending NYU and seeing the park more frequently, I can’t help thinking of the story every time I pass the chess plaza in the west corner of the park. Eventually I became curious enough to do a little research, and it turns out that the tables are quite interesting in their own right. It turns out that the chess hustlers who inhabit the southwest corner of Washington Square Park are only the most recent embodiment of a long and proud tradition of street chess. These players set up their boards in the park, charging by the game, by the hour (for lessons, of course), or sometimes betting on the outcome. While this last is technically illegal, the police have generally turned a blind eye over the past several decades. Chess and checkers tables have been a fairly common part of NYC’s public parks since the 1940s. but the popularity of “street chess,” is held by most to have begun in the late 1960s or early 1970s, when a man named Bobby Hayward set up a chess set on top of a garbage can at 43rd St and 8th Avenue. This was not a new idea—in fact, Humphrey Bogart is said to have supported himself by playing chess during the Great Depression—but taking the game to the street was apparently a new innovation. In their time the Washington Square tables have hosted the elite of the chess world. 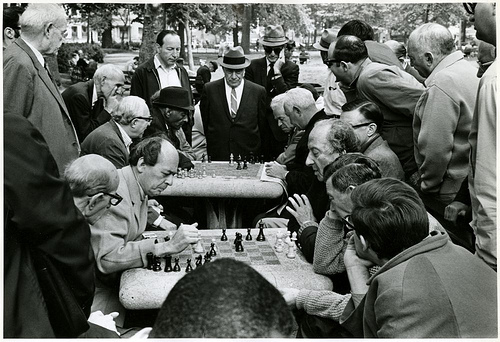 In the 1960s and ‘70s particularly, the park was well known in the chess world as a center of the game where one could find players like American Grandmaster and 11th World Champion Bobby Fisher, International Master Kamran Shirazi, and Grandmasters Joel Benjamin and Roman Dzindzichashvili. More recognizable (to the general public anyway) past Washington Square players include Stanley Kubrick and Heath Ledger. 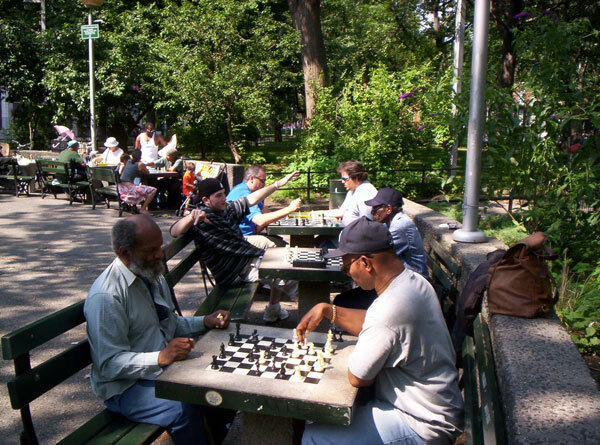 Today the park is still very much an active part of the chess world, and although the current players might be less well known, the hustlers are celebrities in their own right. Typically playing five-minute games of “speed” or “blitz” chess, men like Russian Paul, Sweet Pea, and JP are known and respected within the local chess community. (I use the term “local” loosely—chess players come from all over the world to play in Washington Square Park). “Chess Plaza” was recently updated as part of a major redesign of the park, but the changes were relatively minimal. There are now 18 tables instead of 19, and a flowerbed in the middle. 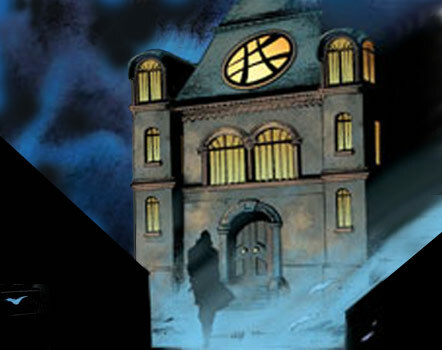 However, it retains its recognizable layout, as featured in the 1993 film, Searching for Bobby Fischer, ’94 film Fresh, and Candido Tirado’s recently premiered play, Fish Men. It’s December in New York City, and all kinds of people are out and about decorating for the holidays and getting ready to celebrate however they traditionally do. Menorahs and Christmas lights begin appearing in windows, New Yorkers struggle to push aside the tourists in front of store windows on 34th street, and municipal employees hang lighted snowflakes on telephone poles. Whatever the season means to you, it’s hard to miss one Greenwich Village Christmas tradition being celebrated again this year: The lighting of the Washington Square Park Christmas tree. The Washington Square Christmas Tree in 2007. Image: Ianqui under Creative Commons. The tradition goes back to 1924, when the Washington Square Association invited the community to be part of a Christmas celebration in the park, featuring a tree and the singing of Christmas carols. The original tree was officially presented on December 24, 1924, by Parks Commissioner Gallatin. The “appropriate ceremonies” included the lighting of the tree, which was to be equipped with “1,500 amber, green and red incandescent lights.” (New York Times, “City’s Celebration of Yuletide Begins” December 24, 1924) as well as caroling, and as the article went to press, the plan was to project the words of Christmas carols directly onto the Washington Square Arch, “…so that all present may read and sing.” The living tree, temporarily set up by the arch, was then to be planted permanently elsewhere in the park the following Monday. Unfortunately, this author cannot find any more information about the planting of the tree. However, an article entitled “Real Trees are Urged for XMas” was published in the New York Times the next year (on December 6, 1925) stating, “Each year…a cry is raised that to have Christmas trees is to endanger our waning forest resources. [Charles Lanthrop Pack, president of the American Tree Association] said, ‘Conservation is wise use. The children should have their Christmas trees.’” It seems that today’s Washington Square Christmas Tree is a cut one, but in the spirit of “wise use,” we can still hope that the original living tree was able to be planted and enjoyed for many years after its journey to New York City! And of course, every time we walk through Washington Square Park and see an evergreen, we can imagine that it’s an 87 year veteran of park life. Although the Washington Square Association continues to host the event, over the years other members of the community have joined in the tree-lighting festivities. For example, from 1993 through 2009, New York University hosted its annual All-University Holiday Sing, with many of its musical ensembles and choirs performing. According to sources at the NYU Archives, even former NYU president L. Jay Oliva joined in the fun during his tenure! 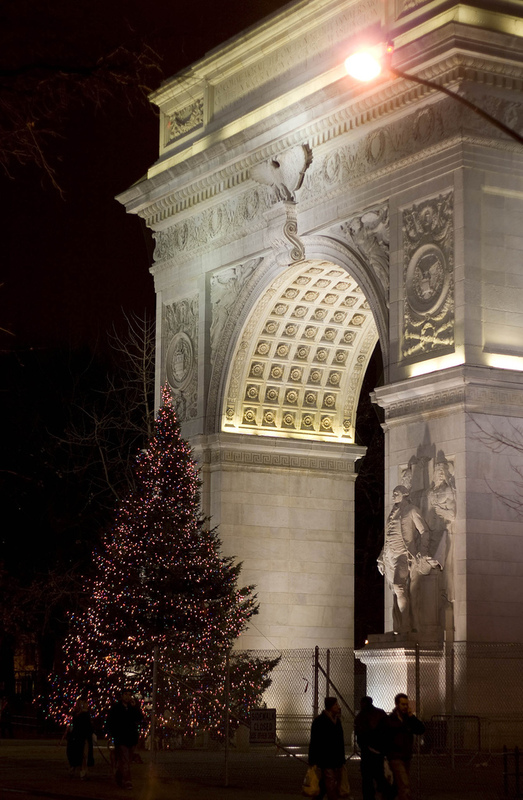 The sing was held in Washington Square Park in the 1990s, often in conjunction with the caroling at the Washington Square Tree Lighting, and continued to be held inside in later years. The last Holiday Sing in evidence on NYU’s events calendar took place on December 8, 2009, in the Loewe Theater on West 4th Street, seemingly signifying the demise of the holiday tradition. Although NYU’s All-University Holiday Sing seems to have been discontinued (and readers, please correct me if I’m wrong) the Washington Square Christmas Tree Lighting is still going strong, and the tree was lit this year on December 7th, despite rainy weather. Caroling is planned for December 24th, if anyone is inclined to see the tree for themselves. Here’s to hoping all our readers have a great holiday, however they do or don’t celebrate, and that all students have a stress-free winter break! Happy holidays from Greenwich Village!